Isaac as usually your comments are nuanced and balanced. Leifer must stand trial in Victoria post haste. Instead of petitioning the Australian Goverment we can however contact Mr Mark Sofer, the Embassador of Israel to Australia. Email details can be found by googling Mr Mark Sofer Embassador. Steve, I appreciate this takes it off the front pages. I don’t want to hush this up. Each year, I think the nature of any approaches to Mr Sofer though should be about re-examining her state. Again, it shouldn’t remotely smell like we don’t respect and honour Israeli systems and professionals. I’m guessing you probably agree? It is Halachically forbidden and a Chillul Hashem to extradite a Jew to Australia. Hashem Yishmor on anybody who participates in this. I haven’t read your justification Mr Hirshman, but I know the issue at hand. I suggest your view is incorrect. You know nothing of the systems in Australia let alone to be able to compare them to facilities in Israel. 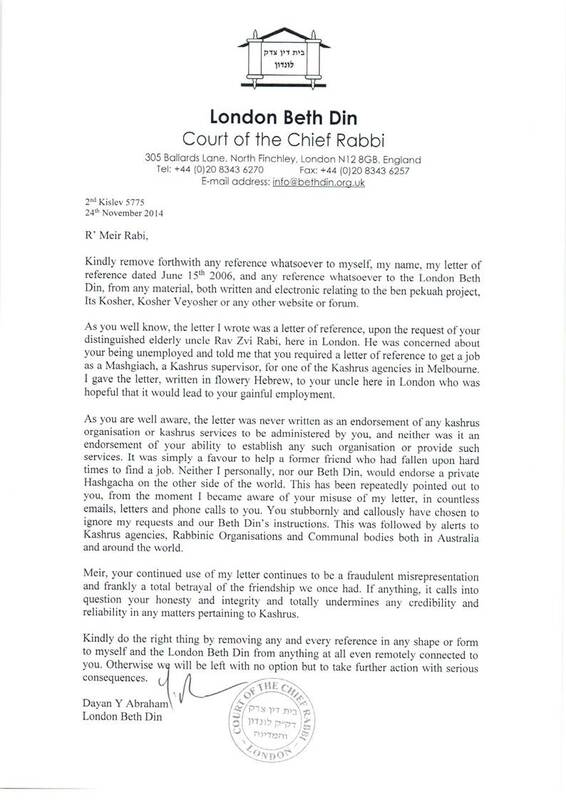 Mrs Laufer will have glatt kosher, visits from Charedim, ability to keep kosher and Shabbos and Yom Tovim etc and no doubt if convicted she can be isolated. I read and it’s really sad. Let me remind you of a simply Halacha that disturbs your ‘them’ and ‘us’ thesis. Go and study the Tshuvos about females who are displaying more tzniyus than what is required by Halacha. Eg, girls wearing a head covering. Guess what. You have to adopt GOYISHE tzniyus. QED.